Our Galapagos Islands Vacation: What Our Family Did in 1 Week! Galapagos Islands: Here We Come! Have you been to the Galapagos? I’m Traveling to the Galapagos! What’s it like to spend a week in the Galapagos Islands? When we were deciding to move to Ecuador one of the things that we found exciting was that the Galapagos Islands are just off the coast. And we asked ourselves, “How could we live in Ecuador and not visit the Galapagos?” We love to travel/explore, and the Galapagos is one of the most unique places on the planet, it was a goal right from the start that we would take a trip off the coast and explore the wonders of the Galapagos Islands. We’ve been here for almost two years, and now we are going! We leave in the morning, flying from Cuenca to Guayaquil, and then on to the Galapagos. We are planning on blogging while we are there, so we hope you will follow and share in the excitement with us. I hear the whales are in town this time of year, hope we get to see some! Please share with us what you liked (or didn’t like) and what you would recommend. If you haven’t been there, is there something you would like to see a picture of? Let us know and we’ll try to capture it, and then post it for you, here on GringosAbroad. Please share by commenting on this post. We returned from the Galapagos Islands yesterday. Honestly, its kind of surreal to have been there – and yet at the same time we kind of got used to seeing Giant Tortoises, Marine Iguanas and the famed Blue Footed Boobies. The islands are amazing and we can’t wait to return. The return rate to the Galapagos is low – somewhere around 2% – which is a little hard to understand. It has become an item to cross off the South American bucket list: Machu Picchu, the Amazon, Cuenca and the Galapagos Islands. But it is so much more than a place to visit for just a couple of days. The islands are also much more than what you might expect from the Caribbean Islands. The focus is on the islands – and preserving them. Of course, you can expect to be very comfortable – great hotels, amazing food and top notch service. The experience was different – and better – than we expected. Here’s our daughters thoughts as we fly to the Galapagos. Woohoo!!!!!! As you read this, I am sitting at the airport with my parents. Today, we are flying from Cuenca to Guayaquil to Baltra Island, Galapagos. We land on Baltra Island at 12 noon and we should be at the Lodge on Santa Cruz around 1pm. Because my parents run an Ecuador travel blog, they will be getting lots of photos and videos of the islands, the excursions, and the animals. And on April 6th they are going to do a draw for the Baby Giants Contest. This is named for the baby giant tortoises that are on the Islands this time of year. While I’m there them, I’ll be taking photos for our blog. Galapagos is like the ultimate place to go!! Check out my past posts on Galapagos. I think that animals are my favorite part of the Galapagos. I love how comfortable they are around people. We spent half of our day traveling to the Galapagos Islands. Flying out of Cuenca at 8am put us in Guayaquil at 8:30. We left Guayaquil at 10am and landed on Baltra Island at 10:45 – thanks to the one hour time difference between the islands and the mainland (flight took 1hr 45min to cover the 1000km distance). So our day one was really just half a day, but we saw a lot. The airport for the main island of Santa Cruz is located on a small island north called Baltra Island. There is a bus that took us from the airport to the southern coast, where we boarded a small ferry to take us to Santa Cruz Island. From there, we traveled 42 km to the small town of Santa Cruz. one land iguana (fairly uncommon to see in the wild – there are a number in captivity here on the island) They are pretty meaty looking. I hope we get to try some… The one in the picture is probably 3 feet long and was really thick. a number of the famous blue footed boobies, the magnificent frigate bird (real name) with bright red throat pouch along with numerous other sea birds. Of course we saw finches – they are everywhere. We stopped to swim at a beach which had cool black volcanic rocks. We heard reports of a huge sea turtle further out by a couple who rented a kayak. Tomorrow is pretty packed. We hike into the highlands of Santa Cruz island, visit two volcanic craters, go tortoise hunting and hike inside of a lava tunnel that is 20 feet high. In the afternoon, we sail to Floreana Island – an island with just 125 inhabitants. The snorkeling is supposed to be great – and there is a chance that we’ll get to swim with penguins. We’ll see. We won’t post tomorrow. Floreana Island doesn’t have internet, so we’ll hopefully be back online when we get to Isabela Island on Wednesday. Here are a few pics from the day. We’ll cover this comprehensively once we get back to the Andes. So after surviving a day offline (it wasn’t that bad … really) we are connected again. In the last 48 hours we traveled from Santa Cruz Island to Floreana Island and then to Isabela Island. Its been very busy. We’ve seen giant tortoises, sea lions, blue footed boobies, frigate birds, the Galapagos Dove, white tipped reef sharks, marine iguanas and sea turtles. Red Mangrove, the resort/tour operator has made this a very relaxed trip – even though we are very busy. It is amazing. Today, we head out in an hour to hike up a volcano. I’m not sure exactly what we will see – aside from plant and bird life. Looks like a 5 hour trip on foot. Drew is getting pretty tired, but we can’t stop her. Yesterday she snorkeled for more than an hour and a half. We’ll write more about the excursions once we get home – here are a few pictures for now. This morning we headed out to hike up a volcano – Sierra Negra. After a crazy (muddy) hike we came to the caldera (or crater) where we could see … fog. It wasn’t that surprising – it had rained for the whole hike up the mountain. But it was a little disappointing. We were soaked up to our knees, mud was squishing in and out of our sneakers. We took a little break while our guide and the Italian newlyweds headed out to find a break in the fog. While they were gone, the fog did clear for a few minutes and we were able to see much of the crater. It looked like small trees, but it was actually heaved up lava and ash. It was very impressive. The crater is approximately 8km x 9km and 300ft deep – the second largest in the world. It last erupted in 2005 – and the eruption lasted 15 days. Our guide said he had just finished a tour at 2pm and it began to erupt at 4:30 the same afternoon. The hike was a blast and Drew loved the chance to get fully muddy. Because of the sun burn she got yesterday she called herself a chocolate dipped strawberry – thanks to the volcanic mud she was covered in this morning. We got to feed these wild and free tortoises some papaya. When the they smelled the papaya, it was the fastest we’ve ever seen a tortoise move. We’ll add videos in the next week or two. They are voracious. This afternoon, we are hanging out on the beach and enjoying the sun. Tomorrow we head to the wetlands and get to see some flamingos. Then we head back to Santa Cruz Island. Should be great. The first picture looks like messed up asphalt, but its actually lava fields that have heaved up. There are kilometers of this landscape on the way up the volcano. Our second day on Isabela Island was wonderful. We went for a walk on a boardwalk in the wetlands and saw Galapagos Ducks and marine iguanas. The boardwalk took us through a mangrove, it was really beautiful to see the mature mangrove trees twisting themselves around each other and up over our heads. After the somewhat disappointing view of the volcano we were really hoping to see some flamingos, and we did! At the end of the boardwalk we came to an area of wetland with a large group of flamingos. The guide said that it was rare to see that many feeding in the area, I think they got news of our volcano trip and showed up just for us. Next we drove along a beautiful white sand beach until we came to a historical spot on the island called The Wall of Tears. It’s a huge wall that was made by prisoners. The rocks used are volcanic and the wall looks very interesting. We are able to walk up stone steps to see the top for an impressive view and cool photo opp. The road from the beach to The Wall of Tears is peppered with giant tortoises feeding on the little green plants, we saw 7 or 8 each way. We also stopped along the way to see Blue Footed Boobies. The tour we are on is called the Darwin’s Triangle Long – 3 islands. It has been amazing to see so many areas of the islands in such a short period of time. Yesterday (Day 6) we had a morning with no planned tours so we made our own. A friend told us about a beach called Tortuga Bay so we decided to check it out. It was perfect: a protected beach lined on 2 sides by mangroves (perfect for snorkeling) one side lined by white sand and the other open to the ocean. We will do a more detailed post about Tortuga Bay in a future post. In the afternoon we went to the Charles Darwin Research Center. We saw land iguanas, giant tortoises and baby giant tortoises. Some of the buildings were run down, but we enjoyed walking around the grounds and seeing the animals. Seeing the baby tortoises was a highlight. Today (Day 7) is a travel day. We left Red Mangrove at 9am and headed north by truck to Baltra Island where one of the two main airports are. We crossed a canal by water taxi then took a bus to the airport. Flight was at 12pm and (as I write this) we are awaiting a flight to Cuenca in Guayaquil. The flight is just 30 minutes and we’ll back home. We are going to cover the trip in more detail over the coming weeks so stay tuned. Join us on Facebook to keep up with all the updates. In a word: amazing. To have seen these animals that we’ve heard about for our whole life was a little hard to believe. For example, I expected the giant tortoises to be big. But they actually were GIANT. More like an office desk than the coffee table I was picturing. Day 1: We arrived at Red Mangrove Lodge on Santa Cruz Island via the airport on Baltra Island. The amount of animals was surprising. We expected that we would need to travel away from the town and hotel to start seeing wildlife, but they were literally right there. Traveling from the mainland was really easy. We left Cuenca at 8am for Guayaquil. We left Guayaquil at 10am and landed on Baltra Island at 10:45 local time. There is a one hour difference between the islands and mainland Ecuador. Days 2 & 3: We traveled from the main island of Santa Cruz to a smaller and sparsely populated island (really, just 125 people) of Floreana. Although the boat ride was a little rough we didn’t get sick. When we landed there was a sea lion and marine iguana there to meet us. The hotel was a row of really great cabins right on the beach. At night, the stars were amazing. As you can imagine, 125 people don’t have too many lights on – and there is zero pollution. The view was outstanding. The trip to Floreana was worth it just for the stars. Day 3 took us to the next island of Isabela – the largest of the Galapagos Islands. Day 4: We started our day on Isabela Island hiking up Sierra Negra Volcano. It rained. A lot. And we got really wet and muddy. But the hike was a blast. The fog cleared temporarily so we could see into the crater – the second largest in the world – but not clear enough to get a clear picture. Sorry. On the way home we visited a great little place called Campo Duro that has a number of Giant Tortoises. I’m not sure why, but we were invited (by the licensed Naturalist Guide) to feed them. So we got to feed them freshly kicked-out-of-the-tree papayas. It was a highlight for us, and Drew was tickled. Videos will follow. Day 5: This was our second day on Isabela Island. The real highlight of the day was seeing the flamingos. We visited a wetlands area that had Marine Iguanas and Galapagos Ducks. But it was the set of more than 50 huge pink birds that really stood out. They group was made up of all males in the brackish swamp. Drew said that they must be embarrassed to be pink. Our guide said it was very uncommon to see so many at the same time there. Day 6 & 7: Without any planned tours we had the day free to see some of Puerto Ayora, Santa Cruz Island. We saw two main highlights: Tortuga Bay and the Charles Darwin Research Station. Because of timing, we didn’t get to snorkel at Tortuga Bay. But this will be the first place we go when we return to the islands. It was beautiful. Drew saw a few schools of fish as she waded close to shore. This trip really gave her a love of snorkeling. Can’t wait to get back to this area to snorkel as a family. I just got back from an awesome trip to the Galapagos! Not everyone knows what the Galapagos is so I’ll tell you. The Galapagos is a series of little islands off the cost of Ecuador near the equator, with many animals, some of witch can not be found anywhere else on earth! Galapagos is unique in another way, it changes so much in landscape that it goes from cactus inhabited lava fields to tropical vegetation! So any way… it was the best trip ever! If you can ever go, you won`t regret it. There are so many critters and I would definitely recommend ‘Tortuga Bay’ for beginner snorkelers , and experienced ones, it is sooo clear! I will be blogging about a few of the animals and places with interesting facts. I hope you keep coming back and commenting. See you then! Galapagos Marine Iguana: This fun little guy was living in a brackish swamp on Isabela Island. He is a Marine Iguana and he was about two and a half feet long. I shot this picture on day 5 of our Galapagos vacation. In certain areas, these are literally everywhere. I think they are my favorite of all the Galapagos wildlife. When they are ready to rest, they just let their bodies drop – they kind of look dead – but they are just sleeping/resting. They have the ability to process sea water internally. They expel the extra salt through their nostrils – it is really cool to see. To do this, they just give a good snort and the super salty snot comes out in a bit of a mist – but with tornado force. We managed to get this on video, so we’ll be adding this over the next couple of weeks. 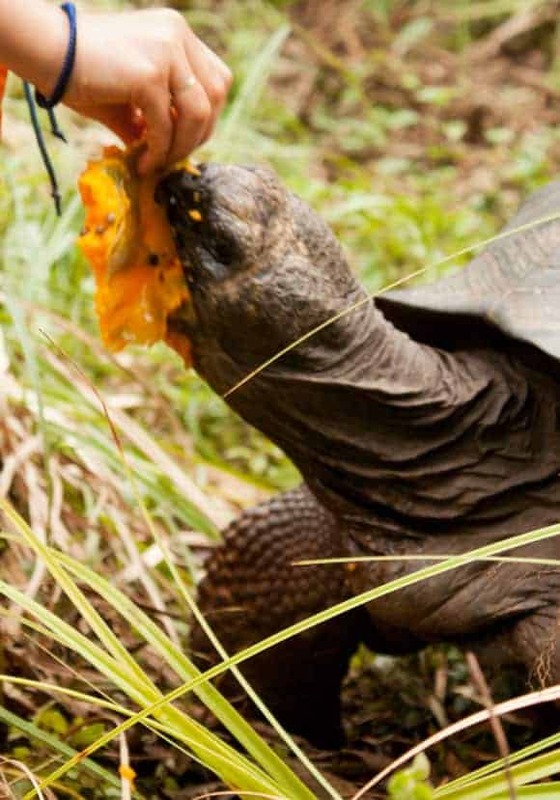 Close Call Feeding Tortoises Papaya: On day 4 of our Galapagos trip we had the chance to hand feed some captive giant land tortoises on Isabela Island. Our guide kicked some fresh papayas out of a tree in the enclosure and gave one to our daughter. Drew was tickled to have the chance to feed them – she loves feeding birds – why not a giant tortoise? When we approached the tortoises, they were timid and pulled their heads inside of their shells. But when they smelled the papaya, the quickly lost their fear and stumbled closer. Although they were still timid they would thrust their heads out, take a bite and then pull back. As you can see in the photo, it got a little closer than we would have liked. After this bite, Drew dropped the rest and it just ate the remaining off the ground. It wasn’t until we got home (and looked closely at our pictures), did we realize how close it came to getting a taste of some white meat with its fresh papaya. Blue Footed Boobies: So here they are. Its not a closeup, but you can sure see the blue feet. They have kind of become the symbol of the Galapagos Islands. They are super unique – what other animal has blue (webbed) feet? In the Galapagos the Blue Footed Booby is as common as seagulls are in North America. There are small colonies of them everywhere. They are majestic in the air, but very awkward on land – especially as they are landing / taking off. Looks like its their first time, every time. Its a hoot to watch. In the picture there are probably 40 – in the original photo, there were more than 150 – I had to crop it to fit it in properly. I love how the blue feet stand out against the black lava rock. (See the large pelican in the top left of the picture?). Flamingos in the Galapagos Islands: So certain things you expect to see on a hike through a swamp. Like mosquitoes and blackflies. Maybe some frogs and little birds. But huge, long necked PINK FLAMINGOS are not on the list of what you expect. At least this isn’t a common find for us. Pink flamingos are the tacky plastic things that people who “love” you put all over your front lawn on special days. When we first saw them, it was kind of hard to believe they were real. There we some many of them, and they were SO pink! By the way: We didn’t see any mosquitoes, black flies or frogs on this hike. I guess the Galapagos Islands really are a special place. Galapagos Pineapple Plant: So probably not all that interesting if you live where pineapples are grown. But growing up in Nova Scotia didn’t give me the chance to see pineapple on the plant. On day 4 of our Galapagos trip we visited a farm with bananas, papayas, oranges, vegetables and pineapple. This was significant for me – because I couldn’t even picture how it grew on a plant. Looks kind of awkward. It’s kind of like bananas. I didn’t know until we moved to Ecuador that bananas grow upside down – at least from my perspective they are. Hay folks enjoyed you comments , keep putting on those nice pictures they are nice to look at. This old boy wont be leaving NS in the near future, ..to old.., love NS and all the people, . plan to stay. Spring will soon be here , it will be veggie time in the garden . Love it Brian and Dina Love you folks too, by for now. I will be living in Cuenca until January. Ofcourse i would love to visit the galapagos islands. Do i have to book my plane ticket in advance or can i wait until November? January is high season – lots of tourists so you might find higher rates and less space on the flights. I guess you can wait, but as you are traveling during high season it might not be a good idea. Thank you. When do you recommend to book the trip to the galapagos. I will be going the second half of january. So just after the holidays. If you are traveling to the Galapagos, you need to book it now. Most of the operators are working on a very long lead time. They are often booked 6-12 months (or more) in advance. I heard that if i waited just a bit, and then book in cuenca, there might be discounts. were have you booked your trip? It might be cheaper if you book here – if there is availability. We actually traveled for work, so we didn’t book with an agency. We run the Red Mangrove Blog. You can contact them for pricing/availability. Hi. We are from Canada and want to travel to the Galapagos for a two week march break trip. Does one have to go through a tour company? Can you stay and travel at your leisure? If we fly from Toronto, which one city should we fly to and tour? Quito or Guayaquil? Any info would be appreciated. Thank you. Yes, you can travel on your own. Once you are there, you are limited as to what you can do. Many of the excursions require a naturalist guide. While its possible to hire one ($160-200 per day) it is less expensive to book a pre arranged tour. When we traveled, we went with Red Mangrove. They arranged everything – transportation, lodging, meals and tours. Check their Galapagos Blog – we are now blogging for them. When you come to Ecuador, you will fly into either Quito or Guayaquil. And you can fly to the Galapagos from either city. Wonderful, so glad you had a great time, Next time round plan to spend some time on San Cristobal as well. I spent 3 months there a while back didn´t want to leave. It was my favourite. I have also spent loads of time on Isabela and Santa Cruz. I hope to visit Floreana next time round. Thanks Jo – one of our guides was from San Cristobal and he couldn’t say enough good about it. Especially the surfing. Next time, I hope we’ll see it. Hi folks. went to Google earth and saw the blue footed boobies , plus some strange looking cactus. di you folks get to see them as well . we are happy for you.My wife and i got to Greenwood for an evening Lol. Hi Eric, great to hear from you. Yes, we saw the funny blue feet and the weird cactus – was a great experience – especially for Drew. More pictures and videos to follow.